By BBC Sport Online's Alex Trickett. Disco lent character to its dance floors, Watergate defined its politics, and Roots - a hard-hitting history of the African-American family - dominated its TV screens. But, in many ways, 1970s America was anticlimactic, failing to live up to the brash reputation of the decade it followed. In American football, the retirement of Jim Brown and "Broadway" Joe Namath left a void. In basketball and golf, sixties icons Wilt Chamberlain and Arnold Palmer were replaced by the less charismatic Kareem Abdul-Jabar and Jack Nicklaus. Boxing told a different tale. While Roberto Duran enthralled at lightweight and Carlos Monzon prowled at middle, the top division was treated to four of its best ever fighters. George Foreman brought his huge frame to bear, terrorising fellow heavyweights after striking gold at the 1968 Olympics. Ken Norton proved he could mix it with any fighter using his durability and guile. And then there were the three memorable duels between Muhammad Ali and Joe Frazier. By the start of the decade, Ali was the most famous man on the planet. He had refused to draft for the Vietnam war and had been stripped of the heavyweight crown he had claimed from Sonny Liston in 1964. "Smokin'" Joe Frazier stepped ably into the breach, knocking out Jimmy Ellis in 1970. And when Ali was reinstated later that year, the stage was set for a rare match-up between two unbeaten champions. Hype for the March 1971 bout was massive. Promoters dubbed it the 'Fight of the Century', and to judge by the celebrity presence, they had a good case. Barbra Streisand, Bill Cosby and Hugh Hefner were all ring-side at Madison Square Garden, while Dustin Hoffman and Diana Ross were thrown out of the press section. Frank Sinatra took photos for Life Magazine to secure prime position along the ring apron. For 15 fascinating rounds, Ali, the boxer, and Frazier, the puncher, stood toe-to-toe, testing out their contrasting styles. The sixth round - Ali's predicted time of victory - came and went. If anything, Frazier looked the more likely to score a knock-out. Then, in round nine, Ali sprang forwards behind a volley of spoken taunts and a flurry of fists. For once he could not impose his will. 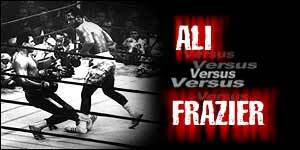 Frazier retaliated, driving his opponent into the ropes and, in the final round, he dropped Ali with a left hook. It sealed a points victory for Smokin' Joe, but rematch and revenge was not far away. After edging victory in 1974, Ali squared up to Frazier for a third time the following year. Both fighters were past their peak by then, but they treated fans to an epic - if savage - contest in the Philippines. Ali and Frazier left their boxing hearts in the ring during the "Thrilla in Manila" and may have inflicted long-lasting damage on each other. But they also proved themselves to be boxing's ultimate gladiators, pushing back the barriers of determination, endurance and pain, time and again. First Frazier pushed forward. Then Ali took his turn. And, by the end of round 10, both sat exhausted on their stools. Ali, who threw every last ounce of his energy in rounds 13 and 14, called the fight "the closest thing to dying". Frazier, who could no longer see the punches that hit him, refused to quit. Eventually his esteemed trainer Eddie Futch took the decision away from him. "Joe, I'm going to stop it," he told his charge. "I want him boss," Frazier replied. "Sit down son. No-one will ever forget what you did here today." He was right. It hardly mattered that Ali had won the rubber match. Boxing will never forget the night two of its brightest stars fought to a stand-still, living up to every bit of their promoters' hype. Links to more Ali at 60 stories are at the foot of the page.